The headwaters of the Chattooga River are located in the Nantahala-Pisgah National Forest in North Carolina, and the “forest plan” for this national forest is now being revised. The first phase of the ongoing plan revision is focusing on lands that are potentially eligible for wilderness, or wild and scenic river designation. 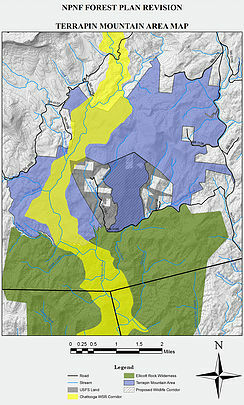 The Chattooga Conservancy is working hard to see that the Forest Service recognizes and protects the wilderness values of the Overflow Wilderness Study Area and the Terrapin Mountain Roadless Area, and that they consider the headwaters of Overflow Creek as qualified to be designated as an extension of the Chattooga National Wild and Scenic River. The Forest Service is seeking public comments on their recent evaluations of potential wilderness areas in the Nantahala National Forest. 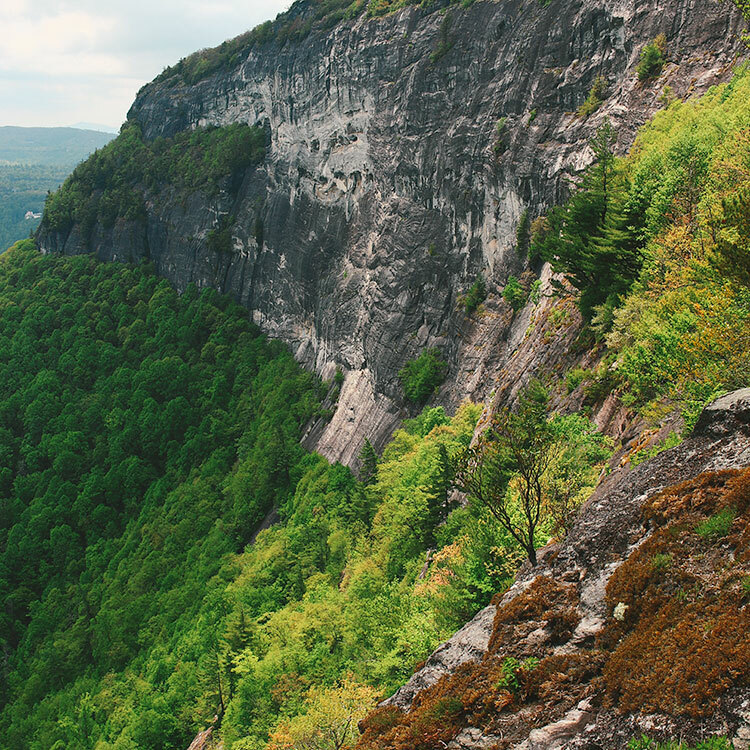 Wilderness is in great demand in the Nantahala National Forest, as shown by the high levels of use in all existing wilderness areas in the Southeast. Ensure that Overflow Creek and Terrapin Mountain’s wilderness opportunities are saved, and that these areas stay wild. Your voice is needed! Please submit your comments! In their recent evaluations of potential wilderness areas, the Forest Service said that the Terrapin Mountain and Overflow Creek areas both fall short of being suitable for wilderness recommendation. However, the Forest Service’s evaluations contain mistakes, so their conclusions lack merit. Your voice is needed to help protect the Overflow Creek and Terrapin Mountain areas. Please submit comments on the Forest Service’s wilderness evaluations. Ask the Forest Service to properly re-evaluate and re-analyze each area’s wilderness characteristics. Request that the Overflow Creek and Terrapin Mountain areas move forward in the evaluation process, and are recommended for wilderness in the upcoming “Draft Environmental Impact Statement” for the Nantahala-Pisgah National Forest’s new forest plan. 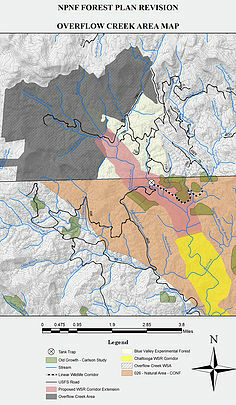 Note: These maps illustrate our proposed Overflow Creek and Terrapin Mountain potential wilderness areas. The maps also include important national forest lands adjacent to the potential wilderness areas, such as the Wild & Scenic Chattooga River corridor, the Ellicott Rock Wilderness, the Overflow Creek area in the Chattahoochee National Forest in Georgia, and critical wildlife corridors. The Overflow Creek area is located in Macon County, southwest of Highlands. The area includes the congressionally designated Overflow Creek Wilderness Study Area. The late Dr. Robert Zahner, Highlands resident and one the most respected conservationists in the Southern Blue Ridge Mountains, championed the Overflow Creek area as a qualified wilderness area. Naturalness. Overflow Creek, within the congressionally designated wilderness study area, is one of the three main tributaries that join to form the West Fork of the Chattooga River, which is protected in the National Wild and Scenic River System. 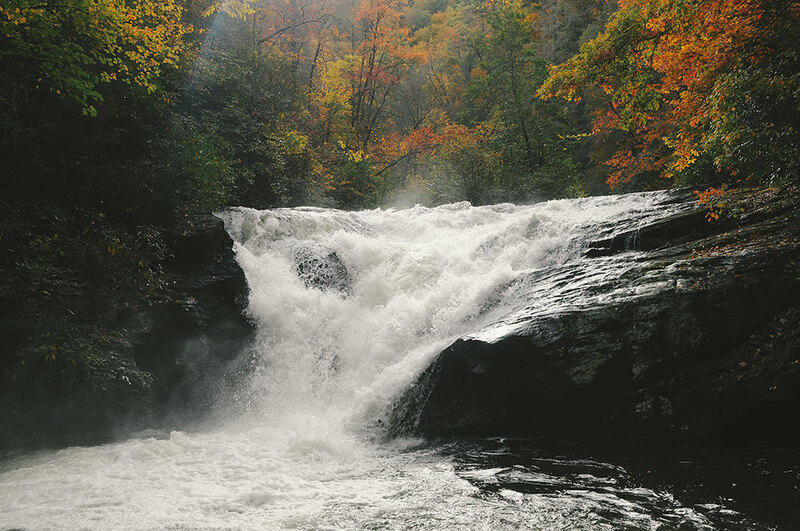 Overflow has some of the most remote and secluded areas in the Nantahala National Forest, including high elevation rock outcrops, cliffs, waterfalls and old growth forests, and contains, as a whole, a high degree of naturalness. Opportunities for Solitude. Wilderness designation would protect the outstanding and abundant opportunities for solitude in the Overflow Creek area. Any impacts to these opportunities are not, as a whole, pervasive, and are effectively screened and buffered by the area’s topography and lush vegetation. Under the Eastern Wilderness Act, moreover, surrounding developments must not be considered to the extent that they were in the Forest Service’s initial evaluation of the area. In addition, the Forest Service should also consider active and/or passive restoration of wilderness characteristics. Opportunities for Primitive/Unconfined Recreation. The Overflow Creek area provides outstanding opportunities to engage in primitive and unconfined recreation that lead to a visitor’s ability to feel a part of nature. These include observing wildlife, hiking, backpacking, hunting, horseback riding, fishing and camping. Again, impacts to these opportunities are not, as a whole, “pervasive,” and they are effectively screened and buffered by the area’s topography and vegetation. Size & Manageability. The Forest Service stated that the Overflow Creek area is “smaller than stand-alone area size usually considered practicable for preservation and use in an unimpaired condition.” However, the Overflow Creek area is not too small. The Forest Service only evaluated the Overflow area as far as the North Carolina state line, and failed to consider the area’s contiguousness with 2,700 acres of primitive backcountry just across the state line, in the Chattahoochee National Forest in Georgia. Overflow’s 3,900 acre potential wilderness area in NC, together with a contiguous 2,700 acres of primitive backcountry in GA, encompass a 6,600 acre potential wilderness area. State boundaries should not determine the boundaries of wilderness. Wilderness helps our local economy. Property values and tourist dollars go up where natural resources have been protected. If Overflow becomes wilderness, management of the area will essentially stay as it is now. If it is declassified as a wilderness study area, it will be developed for other uses. The Terrapin Mountain area is located in Jackson and Macon Counties, just south of Cashiers, and is a 5,450 acre core area of rich biological diversity. It includes the Chattooga Cliffs—a unique scenic attraction along the Chattooga Wild and Scenic River—and portions of the Chattooga Wild and Scenic River corridor. A viable wildlife corridor also exists that connects the Terrapin Mountain area with the Ellicott Rock Wilderness Area. Naturalness. The Terrapin Mountain area, as a whole, has a high degree of apparent naturalness. It includes impressive granitic domes at higher elevations, rare plant and animal communities, and supports high quality waters and diverse aquatic communities. Old logging roads throughout the area are not maintained and are almost completely overgrown. Linear wildlife strips, moreover, are not to be considered as a limiting factor for wilderness, under the guidelines of the Eastern Wilderness Act. Opportunities for Primitive/Unconfined Recreation. The Terrapin Mountain area offers outstanding opportunities for solitude and unconfined/primitive recreation. Under the Eastern Wilderness Act, adjacent land uses and development cannot be the sole negating factor for an area’s opportunities for solitude and unconfined/primitive recreation. Size & Manageability. The Forest Service argues that existing private land inholdings impact the area, and that a viable wildlife corridor between Terrapin Mountain and the Ellicott Rock Wilderness Area is prohibited by private land inholdings; however, their analysis is incorrect because much of the inholding acres have been acquired by the Forest Service. Under the Eastern Wilderness Act, moreover, adjacent private land ownership patterns should not be the sole negating factor for an area’s size and manageability as a wilderness area. Wilderness designation for the remote, biologically rich Terrapin Mountain area, and its connectivity with Wild & Scenic Chattooga River Corridor and the Ellicott Rock Wilderness Area, will help provide for viable populations of unique native plants and animals. Help ensure that the Forest Service’s mistakes are corrected, and that the Forest Service gives proper consideration of the Overflow Creek and Terrapin Mountain areas as potential wilderness areas. Your comments can help protect these remarkable landscapes for future generations!